This spring nearly all popular BitTorrent sites were blocked by Indian ISPs following a court order. 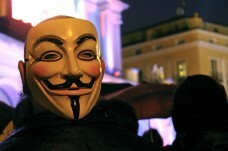 The blockades were eventually lifted, but the many “Anonymous” groups who revolted are not done yet. The latest target is the anti-piracy group Copyright Labs, whose servers were painfully compromised this week. The hackers didn’t take the site down, but altered the message that is sent to website owners by their automated takedown tool. Two months ago millions of Indians were shaken up by a mass anti-piracy action. Internet providers all across the country blocked access to major BitTorrent sites such as The Pirate Bay and Torrentz.eu after a local court issued a so-called John Doe order. The order wasn’t targeted at a specific site or ISP but gave the copyright holder carte blanche to demand broad blockades, which they did. In response, Internet providers, government websites and media companies were targeted in DDoS attack reprisals by “Anonymous” groups. The blockades were eventually lifted with the Madras High Court ruling that Internet providers can no longer be asked to ban entire sites. With that, millions of Indians were able to access their favorite sites again. In future, copyright holders will have to specify the exact URLs where their content is being made available. This is where the Indian anti-piracy group Copyright Labs comes in again. The group, who previously demanded site-wide blocks, switched to contacting owners of file-sharing sites with the request to remove specific URLs. However, a certain “Anonymous” group took exception to this new strategy and let this be known in an unusual way. Somehow, the person who gained access to the Copyright Labs web server managed to replace the takedown URLs with their message. Using the Anonymous handle the hacker(s) point out that they disapprove of Copyright Labs’ anti-piracy efforts. This message was sent in hundreds, if not thousands of emails to various website owners. Needless to say, BitSnoop’s owner wasn’t pleased with the bogus takedown emails, and he sent the following reply to Copyright Labs. Your email is blacklisted, don’t bother sending any more. We don’t care if you were hacked or whatever – not our job to read this crap. This left the Indian anti-piracy group with no other option than to apologize. In their reply the anti-piracy group asks for forgiveness while noting that the BitTorrent site has always been very helpful. Our apologies for the confusion caused. Our system was hacked. BitSnoop has been great support to us always with speedy responses. We request u to kindly accept our apologies and support us as always. It’s interesting to see that Copyright Labs is so fond of BitSnoop, because a letter obtained by the Software Freedom Law Center (SFLC) clearly shows that the group demanded the site to be taken down in April, along with 271 other sites. How much damage Anonymous has done to Copyright Labs’ server is unknown, but its website has been unreachable for days. At the time of publication the Copyright Labs site is still displaying a “down for maintenance” notice.